HTTPS encryption is hot in the news for some time, now. It not only affects online marketing on webpages, but also email marketing practices. Google shares open data that sheds light on the adoption of email encryption. I present you a view on the data set from a completely different perspective. HTTPS wants to make connections between browsers and websites safer using SSL or TLS encryption. For instance, no man-in-the-middle like the NSA should be able to intercept an email address, which was submitted in a newsletter sign-up form. Email messages themselves shouldn’t be an exception. For example, it’s recommended to reference images like your open tracking pixel via HTTPS instead of HTTP in order to prevent unexpected surprises that could harm campaign outcomes. Even more importantly, any submission and transmission should be based on HTTPS and TLS protected SMTP connections. Otherwise transportation would be just like passing postcards over the web. Many were not aware of that, at least until the NSA knocked on several doors, undermining trust and conficence in the web. Back in 2013, email service providers in Germany sort of newsjacked the NSA data surveillance scandals. GMX, WEB.DE, T-Online and a few others formed an alliance called e-mail-made-in-germany.de to build a “safe harbor”, with which they want to ensure safe email transportation among themselves. The participants covers about 70% of the market of primary consumer email addresses in Germany. Although I doubt that the alliance around data privacy contributed significantly to that. Anyway. Thus, if you don’t want to irritate your Gmail subscribers, make sure your mailservers submit messages securely using TLS encryption. Google data for competitive intelligence? The data set holds more than meets the eye. To me, the most interesting part is not necessarily the percentage of TLS inbound and outbound traffic from different domains. It lies in email service provider (ESP) popularity and ESP usage trends, which you can derive from it – to a certain degree. I wrote about it already in this post. Now, more than one year later, let’s have another look on what changed: Who might use – according to Google’s data – a different provider today than compared to a year ago? 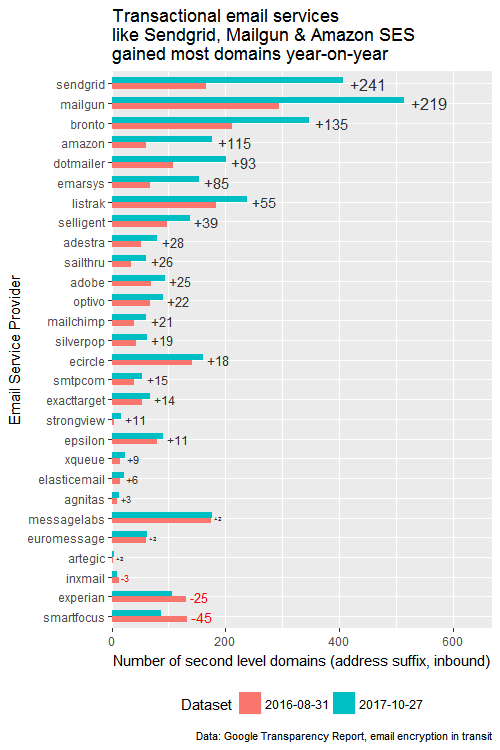 Which ESPs gained the most from migrations?